The conference was a great success, I am happy to report. The Yarn Tasting was a particular hit. 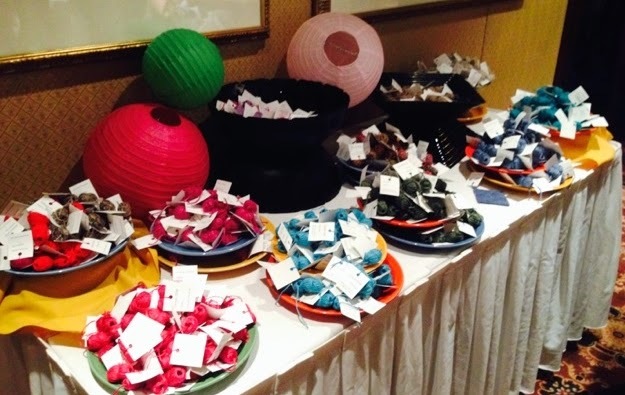 Here is a photo of the goody bags as we were sorting the yarn for each. It gives you an idea of the scale. We set the tables up as if for a buffet. Everything went very smoothly and StevenBe and Stephen West were perfect hosts. They did a trunk show. 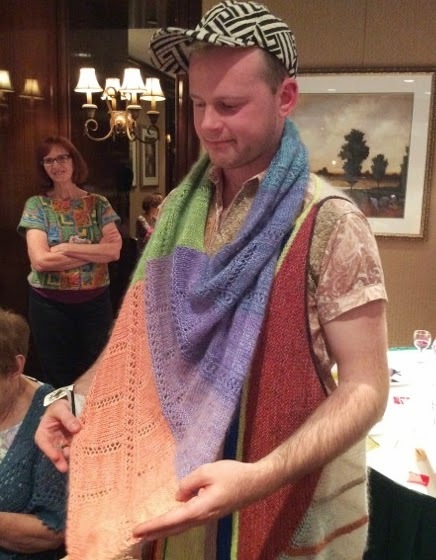 Here is a picture of Stephen showing a shawl. Suzanne Bryan, one of the Co-Chairs of the Masters Hand Knitting Committee is in the background. The event would not have been possible without her, Binka Schwan and Charles Gandy's help. The market was great. I spent quite a bit of time at RedFish picking out yarn for my next sweater. I was so glad they came. They had a great market as well. It was wonderful meeting so many of my students. It means a lot that they come to the show. A few course orders were waiting for me along with some lessons to review. This week's tip is a special request of someone working on the mitten for Level 1 of the Masters Program. It is something I never really thought about. I did an informal poll of the Co-Chairs to see what they recommended and I got several different responses so I have included several different methods. When you work in the round it is necessary to join the last cast on stitch to the first. The most important thing is that you not twist the stitches. If you do, you will discover it a few rounds in and the only solution is to start over again. The next thing to watch out for is that the join be inconspicuous. If you are not careful you can have a long horizontal strand between the first and last stitch. This is the method I (and several of the Co-Chairs) use. When you are finished with the cast on, just go ahead and work the first stitch. Take care to pull the working yarn tightly. (This is Step 1.) The photo shows a mini swatch where I have done this. Notice the yarn tail. When you are finished, use the yarn tail to neaten up the cast on edge. Think of this as embroidery. The next photo shows the same swatch with the yarn tail woven in. I've used this method as well. When you finish the cast on, slip the first cast on stitch from the left needle to the right needle. Pass the last cast on stitch over the first cast on stitch and onto the left needle. You then work this stitch. Crossing the first and last stitch provides a tight join. The photo shows this join. It is fairly inconspicuous. This method and the next one both require casting on one extra stitch. I have to say, of all the methods, this is my least favorite. You slip the first cast on stitch to the right needle and pass the last cast on stitch completely over the first stitch. You then transfer the first stitch back to the left needle and work it. If you look closely at the photograph below, you can see the stitch you have passed over the first stitch. After a bit of research on the topic, I found that this is the most common method. I don't think it is all that attractive. As with the last method, you cast on one extra stitch. 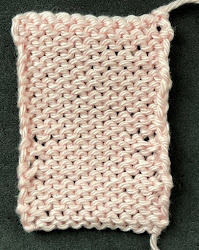 You transfer the extra stitch to the left needle and you either knit (or purl) it along with the first cast on stitch. Salon will be on Sunday, August 3 from 2-5pm. Hope you can make it! Before I left for Manchester, I finished the Child's Nordic, except for sewing it together. The sleeves are done as well. I picked up the neck band before I started the sleeves. I was concerned I wouldn't have enough yarn. Since this is all hand dyed, there is a bit of variation between the skeins. I finished and had 2 yards to spare! I didn't get much knitting done at the conference but I have finished the back and am working on the charted section of the front for the adult size. This hasn't been blocked yet. I should have them all finished up this week. That is the plan, anyway. Obligatory cat photo. Here is a photo of my poor blind baby, Petipa, checking out this sweater. Thank you! The information is very helpful as is the video on YouTube. The camera angle is a bit off on the last join so your hands are up above the screen, at least on my iPad. No matter for me, I'm going to use the first one you suggested. Thanks again. My favourite method for teaching it is a provisional cast-on, although I don't always bother with the extra knitting for my own projects. Cast on, any method, in waste yarn, knit until stable (half an inch or so), then join (still with waste yarn), knit until stable, then start main yarn. The often too-tight cast-on is then replaced with a bind-off. That long horizontal strand at the join doesn't happen. You can easily tell if the join is twisted. If you use the same type of yarn, it becomes a gauge swatch. (Make large, put on head, pinch, count pinched, decrease that number, knit one more round in waste = hat with no math, and after finishing the top decreases you can make the brim longer.) 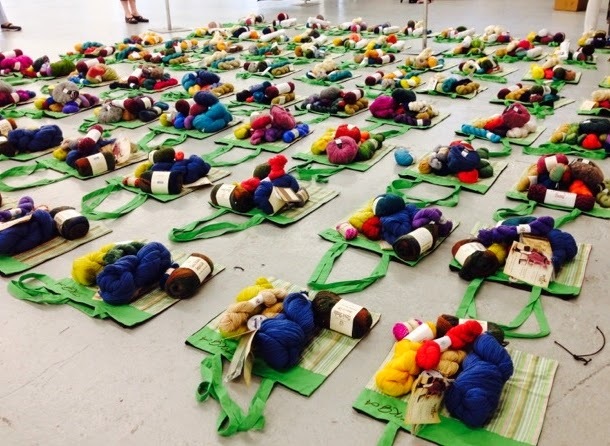 Also, new knitters are using waste yarn when they're least confident, so less anxiety. Bonus: If the first row is k1p1 ribbing, you don't even have to bind-off. Aside: Avoiding the step at the join when binding off would make a good article. I particularly enjoy seeing your current projects. Thank you for keeping this blog!